1.1 Amazon Super Value Day Quiz – How to Win? Amazon Super Value Day Quiz: -Hey Coolzdeals Readers, We hope you all are doing good today.We all know that Coolzdeals is posting all amazon Quiz and contest answers first on net. As we post Quiz Answers first on the Internet. All Live Quiz answers you can see from Amazon Quiz Answers today. Also, Winners list you can see from Amazon Quiz Winners. Today Amazon is back with Another Quiz. Amazon is Organising quiz about Super value. In this Quiz Amazon Rs.9,999 Amazon pay balance. So, You have to Answer all Questions correctly and you will get a chance to come on the list of winners. 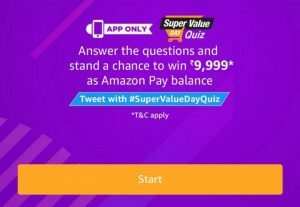 Amazon Super Value Day Quiz – How to Win? 2. Log in or Sign up for Amazon App. 3. At Home Page, you will see the banner of Today’s Amazon Quiz. 4. Click on that banner and Quiz will start. 5. Now, see answers from below and give answers.